"excellent staff good food comfortable room"
Hotel Los Hermanos is located in Ocaña on Pilarejo street number 14, about a 20 minute driving from the spectacular gardens of Aranjuez. This family management hotel consists of 17 rooms and 18 apartments where you can relax in a quiet and comfortable place, because your rest is our main goal. It has a restaurant which serves the traditional Spanish cuisine. 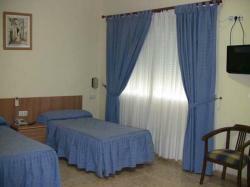 The accommodation communicates with the A4, A40 and AP36 motorways, 45 minutes driving from the city of Madrid. Reservation may be cancelled or amended up to 24 hours prior to day of arrival of the client. Failure to cancel your booking prior to this time or in case of no show will result in a charge of one night's accommodation apart from the initial guarantee deposit. In order to amend a reservation, please contact directly to the hotel which details figure in the voucher. If your amendment reduces the number of nights or rooms the deposit will not be refunded and will not be discounted of the modified reservation fee. "good admosphere. kind persons. Nice family at the hotel." the ease of locating the hotel on leaving the motorway"
"good value, clean, efficient, convenient for overnight travel stay"
"not much in the local town, best to say that its a good place to break the longer journey"